India's Bose & Thapa: Captaincy has made us more responsible & confident! Home / International Football / Asia / India’s Bose & Thapa: Captaincy has made us more responsible & confident! India’s Bose & Thapa: Captaincy has made us more responsible & confident! They say that leaders are born not made. But a true leader is him who accepts the challenge to guide the team through the thick and thin. 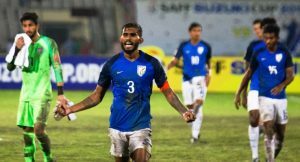 The Indian National Team playing in the ongoing SAFF Cup has had new Captains and the duo – Subhasish Bose and Anirudh Thapa in unison admitted that the Captain’s armband made them “more responsible and confident”. “The captain’s armband is a huge honour for me and I felt within myself that I have become a more confident and responsible person now,” Bose said. Thapa who is the youngest-ever National Team captain in Indian Football history, mentioned that there was “added pressure”. But “it is always good to be under pressure”. “But as a skipper, you are the first person of the team to take the responsibility. Coach entrusted me with this honour and I’m really thankful to him. I would love to be under the same pressure a thousand more times,” he smiled. “Chhetri-bhai has always been the leader for me. Since the Tri-Nation Series, I have always tried to follow him closely. As the days passed by, I have got along with the senior players and they have also opened up. Every session has helped me learn something new and hopefully, I’ll do more,” Thapa pronounced. Thapa had made his National Team debut against St. Kitts & Nevis in the Tri-Nation Series in Mumbai in 2017. Previous Neo Collection: Bright new look for UMBRO Top Equipment! Next Salgaocar FC face Sporting Clube de Goa in AWES Cup final!